Touch typing has been taught the same way since the advent of the QWERTY keyboard. You start with your fingers on home row [ASDF - JKL;] and, by moving each finger along its vicinity of keys, you can effectively reach them all. I was instructed to type in this manner throughout all of my academic studies from elementary school onward; I have always hated this technique. Very early on I had developed my own spontaneous approach to touch typing. I don't rely on any formal home row and my pinkies mostly just chill out, with my index and middle fingers taking on the bulk of the work. Using my own approach over the formalized standard, I have always been a very fast typist. Below is a video of me taking a two-minute, randomized English sentence timed test (courtesy of Typera.net), with the end result being 113 WPM (Words Per Minute) and 565 CPM (Characters Per Minute). In an 8th grade technology education course, we had to take timed typing tests at the start and end of the semester. I dragged my feet through the mud the entire semester, using the dreaded home row stance whenever the teacher was looking. During the first timed test, the teacher monitored each student's hands to ensure they were using "proper finger positioning" when typing. As a consequence, I performed much more poorly the first time around, albeit still faster than most in the class. For the final timed test, we had covers placed over the keyboard, which allowed me to use my own technique. This doubled my overall speed. 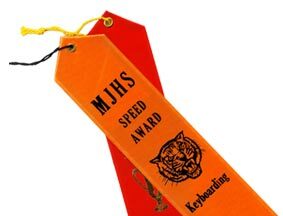 Thus, I earned not one but two prestigious ribbons at the end of the year: 'Speed Typing Award' and 'Most Improved Typing Award' even if the improvement came by merely switching to my own typing method. In my relatively sporadic typing technique, my left pinky is only used for Shift and my right pinky is only used for Enter, ? and ". The index and middle fingers cover every other key from the 'W' column to the 'O' column, with the ring fingers handling the few remaining keys. I do not have a specific starting position for my fingers, but in general I will place my index fingers near the 'F' and 'J' keys with my middle and ring fingers offset and one row higher, and my pinkies resting around the Shift and Enter keys. My logic behind using the index and middle fingers for the majority of typing is that they are the strongest and most controllable fingers and therefore do not take as much effort to type with as would my pinkies and ring fingers. Perhaps there are others who type like me as well. I never studied other typists; I just know that growing up it was seen as an unnatural approach, despite the fact that I could out-type all of my teachers and pretty much everyone else using my own method.